Dan Ellsberg has given us a book that shows the urgency of re-engaging on nuclear disarmament, writes John V. Walsh. “From a technical point of view, he [director Stanley Kubrick] anticipated many things. … Since that time, little has changed, honestly. The only difference is that modern weapons systems have become more sophisticated, more complex. But this idea of a retaliatory strike and the inability to manage these systems, yes, all of these things are relevant today. It [controlling the weapons] will become even more difficult and more dangerous.” — Russian President Vladimir Putin commenting on the film, “Dr. Strangelove: or How I Learned to Stop Worrying and Love the Bomb,” in an interview with Oliver Stone, May 11, 2016. Putin had not seen the movie and did not know of it before Stone showed it to him. The “Doomsday Machine,” the title of Daniel Ellsberg’s superb book, is not an imaginary contraption from a movie masterpiece. A Doomsday Machine uncannily like the one described in “Dr. Strangelove” exists right now. In fact, there are two such machines, one in U.S. hands and one in Russia’s. The U.S. seeks to hide its version, but Ellsberg has revealed that it has existed since the 1950s. Russia has quietly admitted that it has one, named it formally, “Perimetr,” and also tagged it with a frighteningly apt nickname “Dead Hand.” Because the U.S. and Russia are the only nations with Doomsday Machines to date we shall restrict this discussion to them. The first component of a Doomsday Machine is a mechanism of launching nuclear weapons with a command structure not always in the hands of a president in either country, something carefully hidden from the U.S. public. The second component is a weapon of such destructive force that it can kill billions at once and then more gradually the entire human race and perhaps all animal life on earth. Here is a brief consideration of Ellsberg’s views as a reminder of the nuclear peril we face along with a plan of action that he and others suggest. Russia and the U.S. each have the ability to strike the other with great force, destroy the other’s cities and industrial and military bases. The essence of this first-strike capacity is the ability to wipe out the deterrent of the other side or weaken it so that the remaining force could be intercepted for the most part. How can a targeted nation respond to such a capability? It must convince the adversary that such a strike is futile because it will not destroy the deterrent of the targeted nation. The attacker must understand that the nuclear force of the targeted nation, its nuclear deterrent, will survive, and the attacker will be annihilated. The first approach to ensure this survivability is to build ever more nuclear weapons. Thus, when the U.S. pioneered its first-strike capability in the Cold War, the Soviet Union responded with a buildup. Quite quickly both had a first-strike capacity with the competitive buildup reaching the insane levels shown here. Each side also took the following additional measures. The first measure to prevent the loss of deterrence is to put the nuclear force on Launch on Warning, which is also described as Hair Trigger Alert. Most of us have heard about this, but we ought to quake in our boots every time it comes to mind. Since the time to respond to a first strike is only tens of minutes for an ICBM (Intercontinental Ballistic Missile) attack, which takes about 30 minutes to travel between the U.S. and Russia, and even less time for a short or intermediate range missile, a targeted country must have its nuclear force loaded onto delivery vehicles and capable of being launched on warning of a nuclear attack. Nuclear warheads that are loaded onto delivery vehicles are said to be “deployed.” They are ready to be launched in minutes. On each side —both in Russia and in the U.S. — roughly 1,600 such warheads were loaded onto long-range delivery vehicles in 2018. (There are several thousand more warheads in reserve on each side but not “deployed.”) It is easy to see the danger inherent in this situation. The second measure to prevent loss of deterrence is “delegation.” This is not widely known or understood. One aspect of a first strike would be an attempt to knock out known command centers so that a retaliatory strike could not be ordered. This is known as “decapitation.”The antidote to decapitation is “delegation,” that is, others besides the presidents and their immediate successors are authorized to press “the button.” It works this way. These “others” are located in secret command centers far from Washington or the Strategic Air Command Base in Colorado, both of which will be targeted in a decapitation strike. If these secret centers find themselves cut off from communication with Washington or Moscow, then the assumption is made that a decapitating nuclear strike has occurred. In that event these “others” removed from the centers of power are authorized to press the nuclear button. These others are not elected officials and in fact we do not know who they are. What Ellsberg discovered is that some of these “others” are military people who are concerned that they too could be hit in a decapitating strike. So they also have the authority to delegate. In fact, no one, perhaps not even the president, nor his circle of advisors, knows who can launch the nuclear weapons. Is it possible that one might be like the fictional General Jack D. Ripper, the psychotic, delusional fellow who gives the launch order in Dr. Strangelove, or someone lusting after the Rapture? In summary, first-strike capability is the source of the problem. It leads to a nuclear arms buildup, launch on warning and delegation. The idea of having such a capability is deeply imbedded in U.S. “strategic” thinking and will be hard to dislodge. The second component of a Doomsday Machine is the weaponry. What is the destructive power of the nuclear weapons used in a first strike? In 1961, when Ellsberg was among those working on nuclear-war fighting strategy for the Kennedy administration, he requested an estimate from the Pentagon of the deaths due to a first strike as the war planners had mapped it out then. To his surprise the estimate came back at once — the Pentagon had made it and kept it hidden. At a time when the global population was about 3 billion, a first strike by the U.S. would result in the deaths of 1.2 billion from explosions, radiation and fire. That number was deaths only, not injuries. And it was only the result of U.S. weapons; it did not include deaths from a Soviet response if they managed one. The deaths would be concentrated in targeted countries, then and now the U.S. and Russia. Ellsberg was stunned to learn that the Pentagon would coolly make plans for such a gargantuan and immediate genocide. And so should we all be. But the damage does not stop there. This is the surprise that the Pentagon did not understand at the time. The ash from the fires of burning cities would be cast up into the stratosphere so high that it would not be rained out. There it would remain for at least a decade, blocking enough sunlight to prevent crops from growing for 10 years. That is sufficient to cause total starvation and wipe out the entire human race, with only a handful at most able to survive. Nuclear winter was publicized in the 1980s and encountered some initial skepticism. The launch of the 1600 “deployed” warheads of either the U.S. or Russia is sufficient to give us nuclear winter. So we in the U.S. have put in place a weapon system on hair-trigger alert commanded by we know not whom that can kill virtually all Americans – along with most everyone else on the planet. We have on hair trigger alert a weapon that is in fact suicidal. Even if we neglect the effects of nuclear winter, the nuclear attacks would be concentrated on Russia and the U.S. So most of us would be consumed. Thus MAD (Mutual Assured Destruction) is replaced with SAD (Self-Assured Destruction). What does the elimination of first-strike capacity mean in practice? This involves two basic steps for the U.S. First, the land-based ICBMs, the Minuteman III, must be entirely dismantled, not refurbished as is currently being undertaken at enormous cost. These missiles, the land-based part of the Strategic Triad, are highly accurate but fixed in place like “sitting ducks.” They are only good for a first strike, for they will be destroyed in a successful first strike by an adversary. Former Secretary of Defense William Perry and James E. Cartwright, formerly head of the Strategic Air Command and formerly vice chair of the Joint Chiefs of Staff, have both called for dismantling the Minuteman III. The second step is to reduce the Trident Submarine-Launched Ballistic Missile (SLBM) force to the level where it cannot destroy the entire Russian land-based missile force. Russia would also need to execute similar measures, taking into account the specifics of its arsenal. Here negotiations, treaties and verification are necessary. But these are impossible in the current atmosphere of Russiagate and Russophobia, which is why both are existential threats and must be surmounted. We must talk despite our differences, real or perceived. An additional measure has also been proposed. All nuclear warheads should be removed from deployed status by Russia and the U.S. (The anodyne term is “de-alerting.”) That is, the warheads should be removed from their delivery vehicles and stored in a way that would take days or even weeks to deploy – that is to remount. This has been proposed by the Global Zero Commission on Nuclear Risk Reduction whose plan is laid out here. Total abolition should be the ultimate goal because no human hand should be allowed to wield species-destroying power. But it seems that an intermediate goal is not only needed to give us the breathing space to get to zero nuclear weapons. An intermediate and readily achievable goal can call attention to the problem and motivate large numbers of people. The Nuclear Freeze movement of the 1980s is a very successful example of this sort of effort; it played a big role in making the Reagan-Gorbachev accords possible. The effort to kill the Doomsday Machines might well be called something like “Step Away from Doomsday” or simply “Step Away.” At two minutes to midnight we must make haste to do this. Abolishing nuclear weapons will require a breakthrough in the way countries deal with one another, especially nuclear armed countries. Let us give ourselves the breathing space to accomplish that. An earlier version of this article appeared on Anti-war.com. John V. Walsh can be reached at john.endwar@gmail.com. 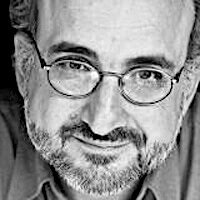 He writes about issues of war, peace and empire, and about health care, for Antiwar.com, Consortium News, DissidentVoice.org and other outlets. 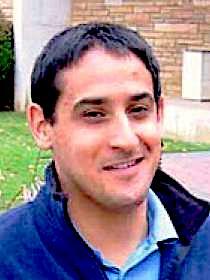 Now living in the East Bay, he was until recently professor of physiology and cellular neuroscience at a medical school in New England. A new, updated data set is now available on a psychological phenomenon that has been labeled “Trump Anxiety Disorder” or “Trump Hypersensitive Unexplained Disorder,” and it says that the phenomenon only got worse in 2018. The disorder is described as a specific type of anxiety in which symptoms “were specific to the election of Trump and the resultant unpredictable sociopolitical climate,” and according to the 2018 surveys Americans are feeling significantly more stressed by the future of their country and the current political environment than they were last year. “As the possibility of a Hillary Clinton victory began to slip away—and the possibility of a Donald Trump presidency became more and more certain—the contours of the new age of American anxiety began to take shape. In a 2017 column, Washington Post columnist Dana Milbank described this phenomenon as “Trump Hypertensive Unexplained Disorder”: Overeating. Headaches. Fainting. Irregular heartbeat. Chronic neck pain. Depression. Irritable bowel syndrome. Tightness in the chest. Shortness of breath. Teeth grinding. Stomach ulcer. Indigestion. Shingles. Eye twitching. Nausea. Irritability. High blood sugar. Tinnitus. Reduced immunity. Racing pulse. Shaking limbs. Hair loss. Acid reflux. Deteriorating vision. Stroke. Heart attack. It was a veritable organ recital. Two years later, the physiological effects of the Trump administration aren’t going away. 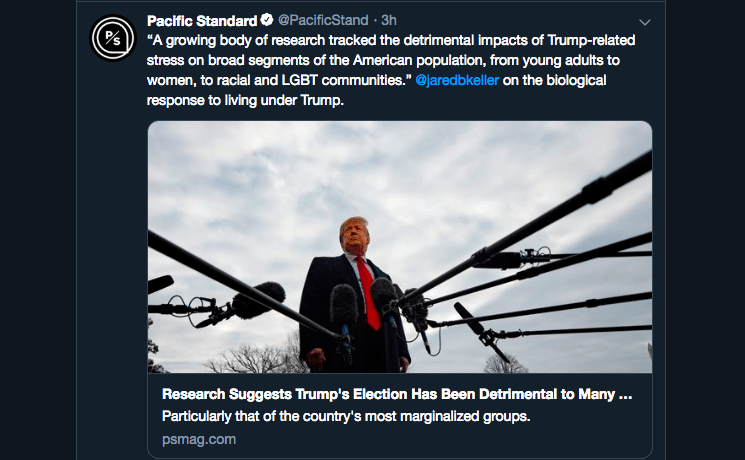 A growing body of research has tracked the detrimental impacts of Trump-related stress on broad segments of the American population, from young adults to women, to racial and LGBT communities. And yet the trending, most high-profile stories about Trump today all involve painting him as a Putin puppet who is working to destroy America by taking a weak stance against an alarming geopolitical threat. This has had the effect of manufacturing demand for even more dangerous escalations against a nuclear superpower that just so happens to be a longtime target of U.S. intelligence agencies. If the mass media were in the business of reporting facts, there would be a lot less “Putin’s puppet” talk and a lot more “Hey, maybe we should avoid senseless escalations which could end all life on earth” talk among news media consumers. But there isn’t, because the mass media is not in the business of reporting facts, it’s in the business of selling narratives. Even if those narratives are so shrill and stress-inducing that they imperil the health of their audience. Trump is clearly not a Russian asset, he’s a facilitator of America’s permanent unelected government just like his predecessors, and indeed as far as actual policies and administration behavior goes he’s not that much different from Barack Obama and George W Bush. Hell, for all his demagogic anti-immigrant speech Trump hasn’t even caught up to Obama’s peak ICE deportation years. If the mass media were in the business of reporting facts, people would be no more worried about this administration than they were about the previous ones, because when it comes to his administration’s actual behavior, he’s just as reliable an upholder of the establishment-friendly status quo as his predecessors. Used to be that the U.S. mass media only killed people indirectly, by facilitating establishment war agendas in repeating government agency propaganda as objective fact and promulgating narratives that manufacture support for a status quo which won’t even give Americans health insurance or safe drinking water. Now they’re skipping the middle man and killing them directly by psychologically brutalizing them so aggressively that it ruins their health, all to ensure that Democrats support war and adore the U.S. intelligence community. They do this for a reason, of course. The Yellow Vests protests in France have continued unabated for their ninth consecutive week, a decentralized populist uprising resulting from ordinary French citizens losing trust in their institutions and the official narratives which uphold them. The social engineers responsible for controlling the populace of the greatest military power on the planet are watching France closely, and understand deeply what is at stake should they fail to control the narrative and herd ordinary Americans into supporting U.S. government institutions. Right now they’ve got Republicans cheering on the White House and Democrats cheering on the U.S. intelligence community, but that could all change should something happen which causes them to lose control over the thoughts that Americans think about their rulers. Propaganda is the single most-overlooked and under-appreciated aspect of human society. The ability of those in power to manipulate the ways ordinary people think, act and vote has allowed for an inverted totalitarianism which turns the citizenry into their own prison wardens, allowing those with real power to continue doing as they please unhindered by the interests of the common man. The only thing that will lead to real change is the people losing trust in corrupt institutions and rising like lions against them. That gets increasingly likely as those institutions lose control of the narrative, and with trust in the mass media at an all-time low, populist uprisings restoring power to the people in France, and media corporations acting increasingly weird and insecure, that looks more and more likely by the day. 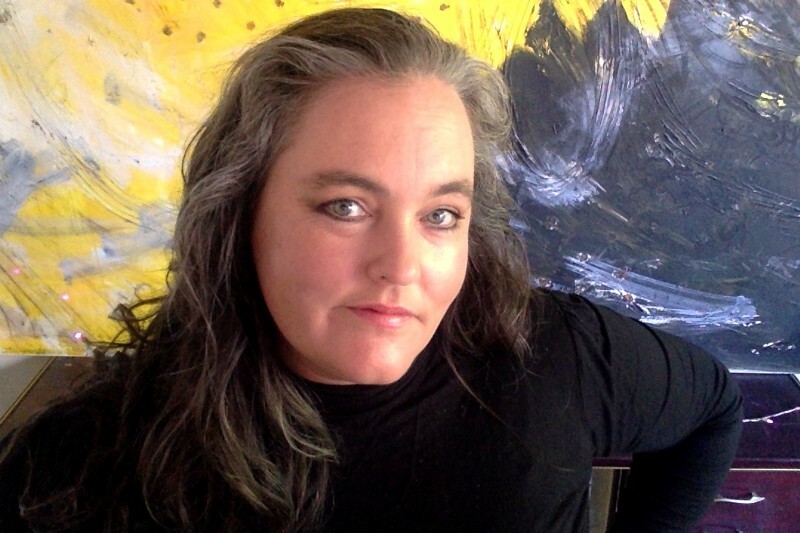 On Thursday BuzzFeedNews delivered the latest “bombshell” Russia-gate report to fizzle within 24 hours of its publication, one in a long series of wrong Russia-gate stories that have the media begging for forgiveness, says Caitlin Johnstone. Following what The Washington Post has described as “the highest-profile misstep yet for a news organization during a period of heightened and intense scrutiny of the press,” mass media representatives are now flailing desperately for an argument as to why people should continue to place their trust in mainstream news outlets. 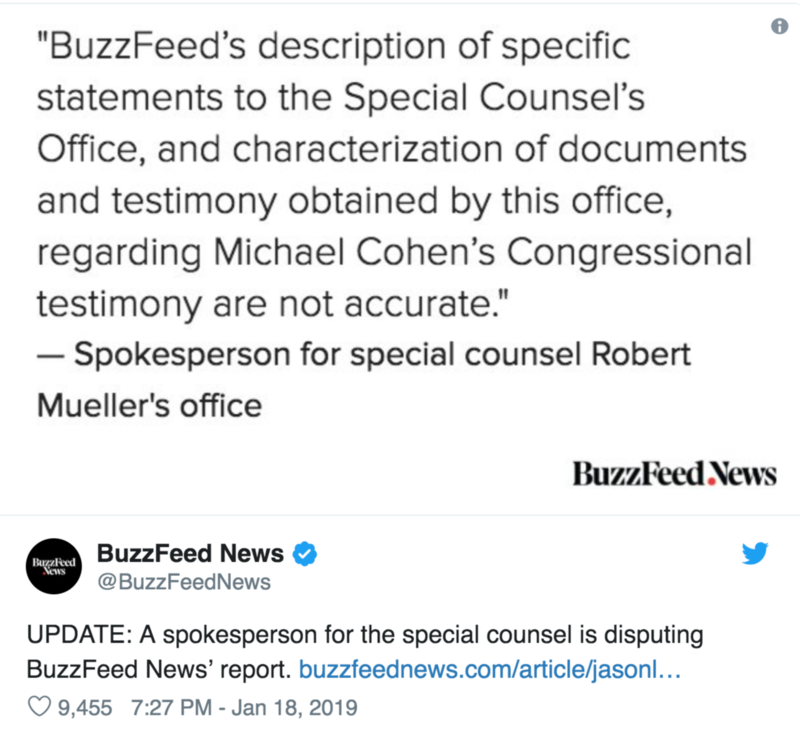 On Thursday BuzzFeedNews delivered the latest “bombshell” Russiagate report to fizzle within 24 hours of its publication, a pattern that is now so consistent that I’ve personally made a practice of declining to comment on such stories until a day or two after their release. “BOOM!” tweets were issued by #Resistance pundits on Twitter, “If true this means X, Y and Z” bloviations were made on mass media punditry panels, and for about 20 hours Russiagaters everywhere were riding the high of their lives, giddy with the news that President Trump had committed an impeachable felony by ordering Michael Cohen to lie to Congress about a proposed Trump office tower in Moscow, a proposal which died within weeks and the Kremlin never touched. 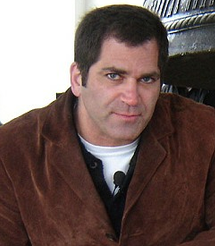 There was reason enough already for any reasonable person to refrain from frenzied celebration, including the fact that the story’s two authors, Jason Leopold and Anthony Cormier, were giving the press two very different accounts of the information they’d based it on, with Cormier telling CNN that he had not personally seen the evidence underlying his report and Leopold telling MSNBC that he had. Both Leopold and Cormier, for the record, have already previously suffered a Russiagate faceplant with the clickbait viral story that Russia had financed the 2016 election, burying the fact that it was a Russian election. This is the behavior of a media class that is interested in selling narratives, not reporting truth. And yet the mass media talking heads are all telling us today that we must continue to trust them. More accountability in media than in politics, Chuck? Really? Accountability to whom? Your advertisers? Your plutocratic owners? Certainly not to the people whose minds you are paid exorbitant sums to influence; there are no public elections for the leadership of the mass media. 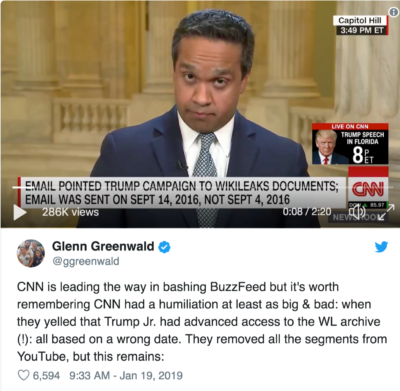 CNN, for the record, has been guilty of an arguably even more embarrassing Russiagate flub than BuzzFeedNews’s when they wrongly reported that Donald Trump Jr had had access to WikiLeaks’ DNC email archives prior to their 2016 publication, an error that was hilariously due to to the simple misreading of an email date by multiple people. The mass media, including pro-Trump mass media like Fox News, absolutely deserves to be distrusted. It has earned that distrust. It had earned that distrust already with its constant promotion of imperialist wars and an oligarch-friendly status quo, and it has earned it even more with its frenzied promotion of a narrative engineered to manufacture consent for a preexisting agenda to shove Russia off the world stage. The mainstream media absolutely is the enemy of the people; just because Trump says it doesn’t mean it’s not true. The only reason people don’t rise up and use the power of their numbers to force the much-needed changes that need to happen in our world is because they are being propagandized to accept the status quo day in and day out by the mass media’s endless cultural engineering project. They are the reason why wars go unopposed, why third parties never gain traction, why people consent to money hemorrhaging upward to the wealthiest of the wealthy while everyone else struggles to survive. The sooner people wake up from the perverse narrative matrix of the plutocratic media, the better. Chalk up another failure for a rabid media desperately trying to prove the Russia-gate story, this time a piece by a reporter with a history of failure, as Joe Lauria reports. In their haste to prove they are right after going out on a limb many times in the Russia-gate saga, reporters have made numerous, egregious errors or have produced unsubstantiated reports that have nonetheless not deterred them from future mistakes. There are at least 50 examples. The Washington Post in Dec. 2016 erroneously reported that Russia had hacked into a Vermont power grid. CNN fired its newly created investigative unit in June 2017 when it wrongly connected Donald Trump to a Russian bank. In Dec. 2017, CNN, CBS and MSNBC all botched the date of an email which led them to falsely report that WikiLeaks had somehow offered Donald Trump Jr. advanced copies of the DNC emails. Guardian reporter Luke Harding, desperate for proof to back up his bestseller “Collusion,” reported in Nov. 2018 that Paul Manafort, briefly Trump’s campaign manager, had met three times with WikiLeaks publisher Julian Assange in the Ecuador embassy in London in a story that provided zero evidence and hasn’t been confirmed by anyone else. In Nov. 2017, reporter Jason Leopold reported for BuzzFeed that Moscow had sent $30,000 to the Russian embassy in Washington “to finance [the] election campaign of 2016,” only for it to be revealed that the money was to pay for Russian citizens in the U.S. to vote in the 2016 Duma elections. Now Leopold has done it again. 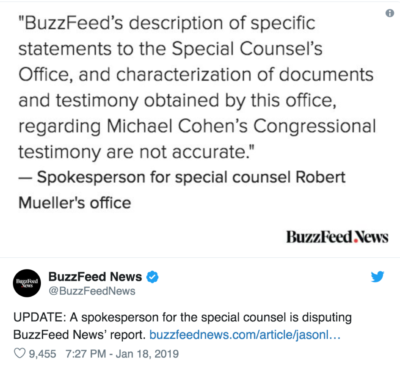 His report last week, with Anthony Cormier, that Trump had told his lawyer to perjure himself before Congress was refuted by Special Counsel Robert Mueller. After Brian Ross of ABC News wrongly reported in Dec. 2017 that Michael Flynn, President Trump’s choice for national security advisor, had met with Russia’s ambassador during the campaign rather than after the election, Ross was forced to resign. Yet Leopold, despite his long history of getting it wrong, continues to be employed. Leopold has had more success with stories based on FOIA requests than with unnamed sources. Consortium News Editor-in-Chief Joe Lauria had the following encounter with Leopold in 2006, which he wrote about in The Washington Post. The May 13 story on the Web site Truthout.org was explosive: Presidential adviser Karl Rove had been indicted by Special Counsel Patrick J. Fitzgerald in connection with his role in leaking CIA officer Valerie Plame’s name to the media, it blared. The report set off hysteria on the Internet, and the mainstream media scrambled to nail it down. Only . . . it wasn’t true. As we learned last week, Rove isn’t being indicted, and the supposed Truthout scoop by reporter Jason Leopold was wildly off the mark. It was but the latest installment in the tale of a troubled young reporter with a history of drug addiction whose aggressive disregard for the rules ended up embroiling me in a bizarre escapade — and raised serious questions about journalistic ethics. 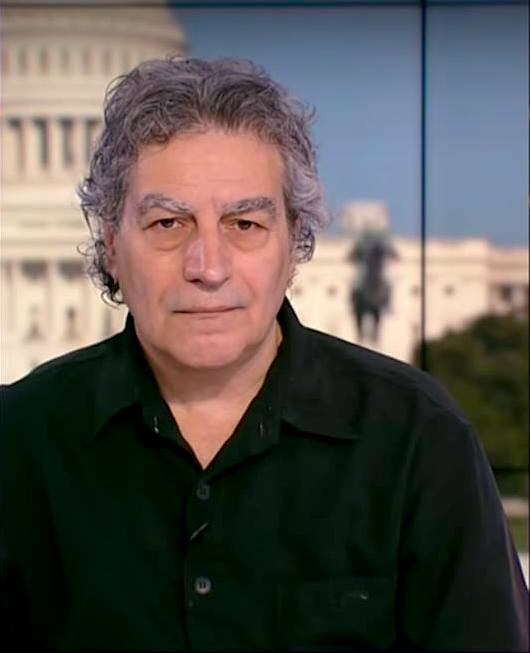 In his nine-year reporting career, Leopold has managed, despite his drug abuse and a run-in with the law, to work with such big-time news organizations as the Los Angeles Times, Dow Jones Newswire and Salon. He broke some bona fide stories on the Enron scandal and the CIA leak investigation. But in every job, something always went wrong, and he got the sack. Finally, he landed at Truthout, a left-leaning Web site. I met Leopold once, three days before his Rove story ran, to discuss his recently published memoir, “News Junkie.” It seems to be an honest record of neglect and abuse by his parents, felony conviction, cocaine addiction — and deception in the practice of journalism. I disagree, but I felt some sympathy for the affable, seemingly vulnerable 36-year-old. Before we parted, I told him a bit about myself — that I freelance for numerous newspapers, including the Sunday Times of London. His publicist had earlier given him my cellphone number. Three days later, Leopold’s Rove story appeared. I wrote him a congratulatory e-mail, wondering how long it would be before the establishment media caught up. But by Monday there was no announcement. No one else published the story. The blogosphere went wild. Leopold said on the radio that he would out his unnamed sources if it turned out that they were wrong or had misled him. I trawled the Internet looking for a clue to the truth. I found a blog called Talk Left, run by Jeralyn Merritt, a Colorado defense lawyer. A chill went down my back. I freelance for the Sunday Times. My first name is often mistaken for Joel. My cellphone number starts with area code 917. I called Corallo. He confirmed that my name was the one the caller had used. Moreover, the return number the caller had given him was off from mine by one digit. Corallo had never been able to reach me to find out it wasn’t I who had called. He said he knew who Leopold was but had never talked to him. I called Leopold. He gave me a profanity-filled earful, saying that he’d spoken to Corallo four times and that Corallo had called him to denounce the story after it appeared. “Joe, I would never, ever have done something like that,” Leopold said defiantly. Except that he has done things like that. His memoir is full of examples. He did break big stories, but he lied to get many of them. He admits lying to the lawyers for Enron executives Jeffrey Skilling and Andrew Fastow, making up stories to get them to spill more beans. “I was hoping to get both sides so paranoid that one was going to implicate the other,” he wrote. I don’t really know why Leopold may have pretended to be me to Corallo. I can only speculate that he either was trying to get a reaction and thought Corallo would be more likely to respond to a conservative-leaning mainstream paper, or he was trying to get Corallo to acknowledge that Rove had been indicted by bluffing that the Sunday Times had confirmed the story. In fact, Corallo told me that “Joel” told him that he had Fitzgerald’s spokesman on the record about the indictment. He has also said he believes Leopold made up the whole story. Leopold still stubbornly stands by the story, claiming that something happened behind the scenes to overturn the indictment. 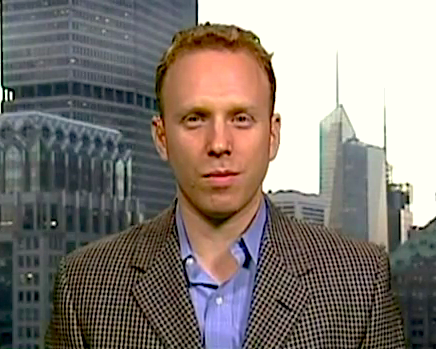 Marc Ash, Truthout’s executive director, said last week that his site will “defer to the nation’s leading publications” on the Rove story, but he declared his continuing faith in Leopold. We may never know what really happened. Most mainstream news organizations have dismissed the Leopold story as egregiously wrong. But even if he had gotten it right and scooped the world on a major story, his methods would still raise a huge question: What value does journalism have if it exposes unethical behavior unethically? Leopold seems to assume, as does much of the public, that all journalists practice deception to land a story. But that’s not true. I know dozens of reporters, but Leopold is only the second one I’ve known (the first did it privately) to admit to doing something illegal or unethical on the job. After reading his memoir — and watching other journalists, such as Jayson Blair at the New York Times and Jack Kelley at USA Today, crash and burn for making up stories or breaking other rules of newsgathering — I think there’s something else at play here. Leopold is in too many ways a man of his times. These days it is about the reporter, not the story; the actor, not the play; the athlete, not the game. Leopold is a product of a narcissistic culture that has not stopped at journalism’s door, a culture facilitated and expanded by the Internet. In the end, whatever Jason Leopold’s future, he got what he appears to be crying out for: attention. A president facing a major scandal, just as the highest-profile trial is about to begin, pardons the indicted or convicted officials around him to effectively stop the investigation that’s closing in on his own illegal conduct. Trump soon? We’ll see. But this actually describes what President George H.W. Bush did in 1992. The Iran/Contra scandal revealed, among other things, that the Reagan/Bush White House had secretly sold missiles to Iran in exchange for hostages held in Lebanon, using the proceeds to fund right-wing forces fighting the leftist Nicaraguan government in violation of U.S. law. The attorney general for Bush who approved the pardons, William Barr, is now being nominated for the same position by Trump. Is this background relevant? Though current news columns are rife with speculation that Trump might likewise protect himself by pardoning his indicted or convicted associates, the dominant U.S. news wire service doesn’t seem to think so. Serving Trump, who faces intensifying investigations from the department Barr would lead, is unlikely to compare with his tenure under President George H.W. Bush. The false implication is that Bush did not himself face intensifying investigations from Lawrence Walsh, who operated out of the Justice Department’s Office of Special Counsel. The misleading comparison is compounded by Tucker describing Trump as “breaking with the practice of shielding law enforcement from political influence” and ousting Attorney General Jeff Sessions for “not protecting him in the Russia investigation” — as if Barr didn’t have direct experience in the first Bush administration with imposing political influence on law enforcement to protect a president from investigation. This deceptive piece was apparently picked up by literally thousands of media outlets. A search of “unlikely to compare with his tenure under President George H.W. Bush” produces over 2,400 results. Walsh had discovered, too, that Bush had withheld his own notes about the Iran/Contra Affair, a discovery that elevated the president to a possible criminal subject of the investigation. But Bush had one more weapon in his arsenal. 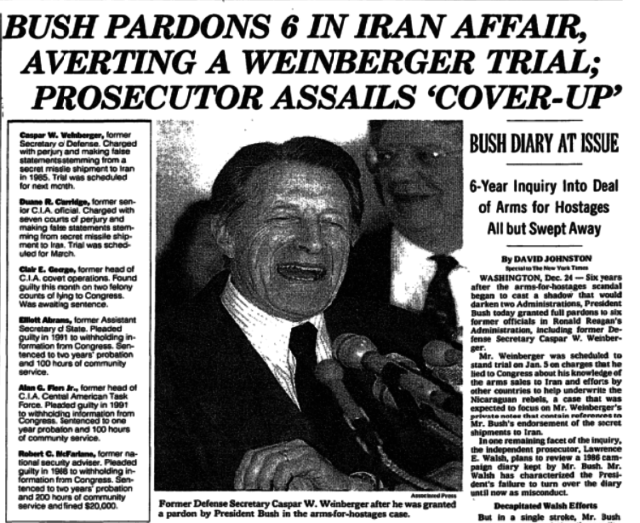 On Christmas Eve 1992, Bush destroyed the Iran/Contra probe once and for all by pardoning Weinberger and five other convicted or indicted defendants. Parry, who died a year ago, left AP after many of his stories on Iran/Contra were squashed (Consortium News, 1/28/18). While much of the media obsesses over every bit of “Russia-gate,” some breathlessly anticipating the next revelation will surely bring down the Trump presidency, it’s remarkable how little interest there is in the trajectory of presidential power. AP’s actions also fit into the institution-protecting mode of what Parry derided as the “conventional wisdom” — which in its current formulation depicts Trump’s authoritarian tendencies as aberrations from the norms of U.S. politics, rather than a continuation of the worst tendencies of his predecessors. 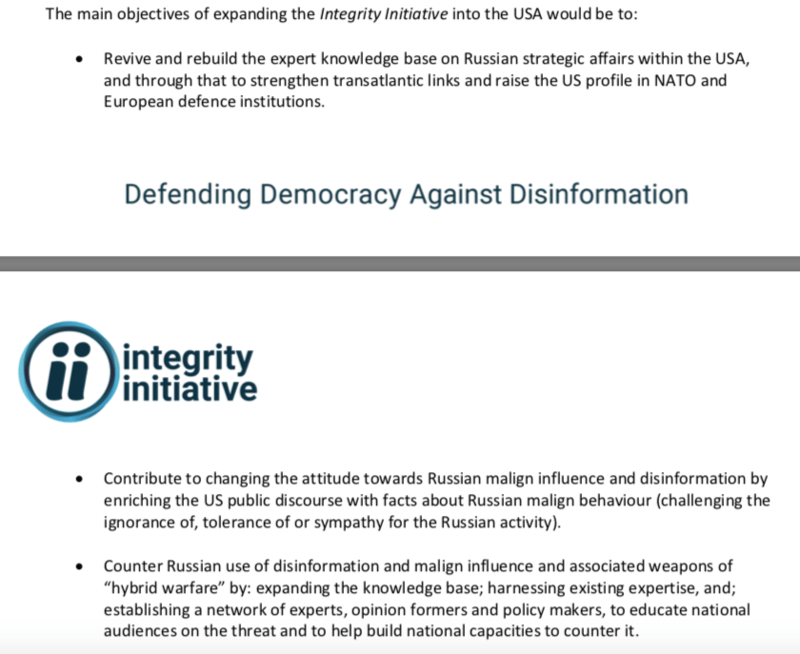 The U.K.-financed Integrity Initiative, managed by the Institute for Statecraft, is ostensibly a “counter disinformation” program to challenge Russian information operations. However, it has been revealed that the Integrity Initiative Twitter handle and some individuals associated with this program have also been tweeting messages attacking Labour leader Jeremy Corbyn. This takes on special meaning in light of the numerous U.K. military and intelligence personnel associated with the program, documented in an important briefing by academics in the Working Group on Syria Propaganda and Media. second, many of the same individuals have also been attacking a second target – Julian Assange, trying to also falsely link him to the Kremlin. Many of these 11 individuals are associated with The Times and The Guardian in the U.K. and the Atlantic Council in the U.S. The research does not show, however, that these tweets are associated with the Integrity Initiative (see further below). 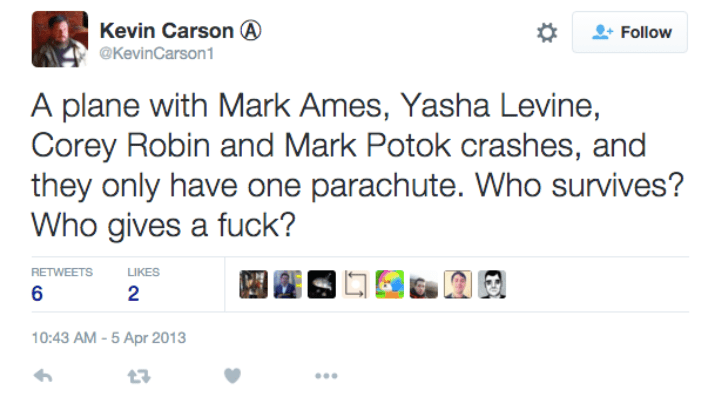 Here are examples of tweets from the 11 individuals. “Why does Corbyn not see that Russia is imperialist and Ukrainians are victims?” and “It’s not just Corbyn. Here’s Swedish leftie @AsaLinderborg explaining why Nato not Putin is the real threat to peace” – linking to the latter’s article in a Swedish newspaper. David Clark, a former adviser to the late Labour PM, Robin Cook, has tweeted that Corbyn is an “apologist” for Putin. Below is another of Clark’s tweets. It is an article of ideological faith for Corbyn and people like him that everything wrong with the world is the fault of the capitalist West. Therefore, nothing can be the fault of anyone else. "the time for equivocation, given the sinister nature of Mr Putin’s regime, is over"
Three Guardian/Observer-linked journalists were invited to speak at an Integrity Initiative event in London in November 2018: Carole Cadwalladr, Nick Cohen and James Ball. “Here’s Corbyn’s principal advisor Seamus Milne on RT explaining why it was the fault of NATO aggression that Russia invaded Ukraine. Nick Cohen has tweeted that “Labour is led by Putin fans” and: “What is worse? Farage and Corbyn and twitter trolls divert attention from Russia’s political assassinations because they believe Putin is innocent or because they are morally corrupt?” He has also retweeted an Observer article of his claiming that Labour leaders have promoted “endorsements of Russian imperialism” and that Corbyn’s policy has given Russia “a free pass” in Syria. Many of the same individuals have also been tweeting false statements about Julian Assange and Russia. The Integrity Initiative twitter site itself retweeted a Guardian smear article about a lawyer, Adam Waldman, visiting the Wikileaks founder. In addition, Cadwalladr has tweeted several times that “Assange was in direct communication with Russian intelligence in 2016” and that “Wikileaks sought assistance from Russian intelligence officers to disrupt the US presidential election.” Cadwalladr is here claiming that Wikileaks knowingly colluded with Russian intelligence by releasing the files on the Democratic Party in 2016: in fact, this is not known or proven at all, while numerous media outlets also published or had contacts with Guccifer 2.0 and DCLeaks in 2016 – though do not figure as targets in her attacks. David Leask, chief reporter of The Herald (Scotland), has described Assange as a “Kremlin proxy” while Anne Applebaum tweeted: “’Wikileaks is a front for Russian intelligence,’” linking to an article of the same headline. Edward Lucas retweeted his Times article suggesting that Assange and Wikileaks are part of the “Kremlin-loving camp”while David Clark has tweeted that “Assange is an active accomplice” of autocrats such as Putin. There are some key points to be made about this analysis. First, some of the tweets made by these individuals on Corbyn and Assange, not all of which are included here, are fair comment, even if, in my view, they are usually wrong. But others go beyond this, inferring that Corbyn (and Assange) are in effect agents of Russia and/or are willingly and knowingly amplifying Russia’s agenda, as little more than “tools” – with no evidence provided (understandably, since there is none). There is also sometimes the association of Corbyn with former communists. These areas are held to constitute smearing. Second, it is not known and certainly not proven that these tweets are associated with the Integrity Initiative. Little is known of the internal workings of the Initiative. It is possible that some of the individuals may have been chosen by the Integrity Initiative to be associated with it precisely because of their pre-existing criticism of Russia or their willingness to accuse figures such as Corbyn with association with Russia. While I am not suggesting that these individuals’ tweets are necessarily linked to their role in the Integrity Initiative, there does appear to be something of a pattern among these people of smearing both Corbyn and Assange. 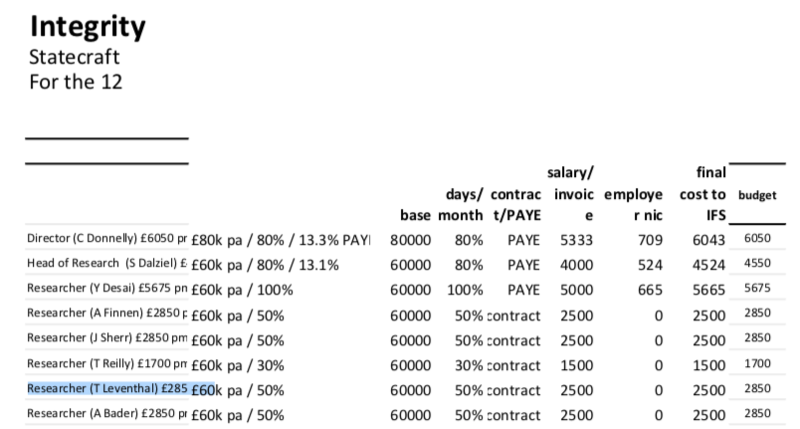 Third, and equally important, this is not a full analysis of these individuals’ outputs: it is limited to their tweets. 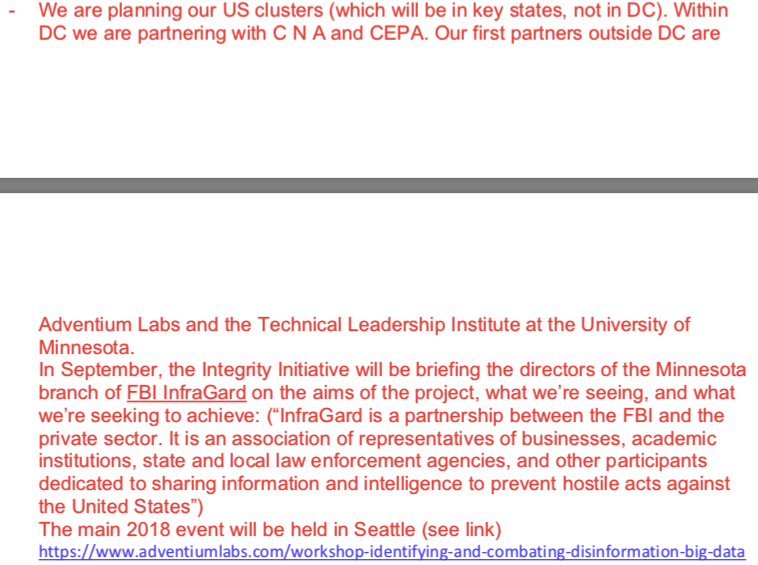 Neither is it a full analysis of the false linking to Russia by individuals associated with the Integrity Initiative: several other journalists and figures named in the documents are not analysed here. Again, further research is needed. Jeremy Kuzmarov argues the Cold War case has enduring relevance to American political culture and provides clues to the motives and machinations underlying the new Russophobia. In January 1950, Alger Hiss, a former State Department employee and director of the Carnegie Endowment for International Peace, was convicted of perjury and sentenced to five years in a federal penitentiary. The sentence, of which Hiss served 44 months, culminated a frenzied political trial that catapulted Richard Nixon to fame, undergirded the advent of McCarthyism and heated up the Cold War. Today, it is worth looking back at the Hiss case because it offers important clues to the motives and machinations underlying the similarly politicized Russia-gate investigations. In both cases, powerful political players appear to have attempted to deflect acts of malfeasance by falsely accusing political adversaries of treasonous behavior while igniting anti-Russia hysteria and paranoid fears of subversion that threatened war between the major nuclear powers. Hiss was the embodiment of the liberal, New Deal establishment, which had promoted a major expansion of domestic social welfare programs. Educated at Harvard Law School, Hiss clerked for Supreme Court Justices Felix Frankfurter and Oliver Wendell Holmes, and worked for the State Department before moving on to head the Carnegie Endowment for International Peace. Supportive of President Franklin Roosevelt’s policy of accommodation towards the Soviets, Hiss had been present at the 1945 Yalta conference, which resulted in a spheres of influence agreement. 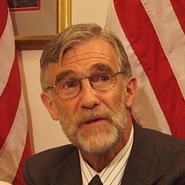 Hiss had also worked as a legal assistant for the Nye Committee in the 1930s, a congressional investigation into war profiteering led by Gerald Nye, a Republican senator from North Dakota. The investigation exposed high-level corruption and connections between American companies and the growth of the Nazi war machine. For instance, it revealed how United Aircraft sold commercial airplane engines to Germany for use in Luftwaffe fighter planes. It showed how Nazi troops were armed with American guns, and how Union Banking Corporation had engaged in a cartel agreement with the German chemical conglomerate, I.G. Farben, soon to be gas maker for Holocaust gas chambers. Because of his work on the committee, Hiss made many powerful enemies. The Republican Party at the time was looking to revive its fortunes through red- baiting tactics that would deflect attention from their anti-labor program. The Justice Department also had begun to investigate alleged treasonous activities by GOP power brokers. Among them was Thomas McKittrick, a former agent of the Office of Strategic Services (predecessor of the CIA) who was the wartime president of the Bank for International Settlements in Basel, Switzerland. He was also an executive with Chase Manhattan Bank and a Marshall Plan administrator who allegedly conspired with his friend, the future CIA Director Allen Dulles, to move looted Nazi gold to Argentina. Another official under DOJ investigation was Sen. Prescott Bush, a managing director of the Union Banking Corporation, which helped provide financing to Nazi industrialists in violation of the Trading with the Enemy Act during World War II. Bush was the father of President George H.W. Bush and grandfather of President George W. Bush. The origins of McCarthyism predate McCarthy. In order to bury the war profiteering investigation and undermine a wartime plan adopted by FDR’s Treasury Secretary Henry Morgenthau to deindustrialize Germany and break the power of its banking cartel, Dulles and his associates began accusing New Deal Democrats of being spies. The first was Harry Dexter White, liberal postwar director of the International Monetary Fund, who had pushed the German deindustrialization plan, and then came Hiss. The GOP’s accusations of treason were part of a political counter-offensive designed to protect the real traitors while bolstering the party’s political fortune. Hiss’ alleged treason provided the “proof” that the Roosevelt and Truman administrations were “dyed pink in Moscow.” Hiss’ trial was in turn politicized as much as the Soviet show trials. John Foster Dulles, President Dwight Eisenhower’s secretary of state, and his brother Allen had worked as attorneys for Sullivan & Cromwell, which according to journalist Stephen Kinzer, “thrived on its cartels and ties to the Nazi regime,” and kept its business with its clients all the way through the war. After supporting Nixon’s campaign in California’s 12th Congressional district against Democrat Jerry Voorhis in 1946, the Dulles brothers began to accuse their enemies of communist subversion in order to bury investigation into their nefarious war-time activities and to undermine Morgenthau’s plan to deindustrialize Germany and break the power of its banking cartel. The first target of their accusations was Harry Dexter White, liberal postwar executive director of the IMF and an assistant to Morgenthau who championed the German deindustrialization plan. President Roosevelt and British Prime Minister Winston Churchill adopted the plan at the second Quebec Conference in September 1944. Truman replaced it in 1947 with the Marshall Plan, a robust program of economic aid that benefited U.S. business. Hiss was the second major target to fall victim to Dulles’ plot. Like Russia-gate, which has deflected attention from the Democratic Party failings, Hiss’ case became a media sensation that derailed critical scrutiny into treasonous wartime activity by plutocratic interests and provided “proof” for GOP voters that the Roosevelt and Truman administrations were “dyed pink in Moscow”–much as Donald Trump is portrayed as a Moscow puppet. Like the allegations against Trump, Hiss’ actual connection to Soviet espionage remains unproven. He never left any traces of even being a socialist. The documents Hiss is alleged to have smuggled were mundane and would have done nothing to harm national security. They included blank and illegible microfilms along with synopses about economic conditions in Manchuria, German trade policy in Braziland, unclassified manuals for operating naval rafts, parachutes and fire extinguishers; information that could have been found in the New York public library. The Hiss case was marred by prosecutorial misconduct and illegalities. Hiss was entrapped by prosecutors who benefited from FBI surveillance of his witnesses and the sharing of that information with the prosecution’s leading witness, Whittaker Chambers, a Time magazine editor who said he had known Hiss in the mid-1930s. Allegations of biased FBI misconduct against Trump are similarly rife. However, Lee Pressman, a labor attorney who was a law school classmate of Hiss and a member of the group, testified that this was a Marxist study group in the 1930s and that Hiss was not a member. Pressman was later accused of being a Russian spy. It was claimed that Chambers and Hiss had been introduced by Josef Peters, alleged brain of the entire communist underground. But there is no record of this, and Peters was mysteriously deported to Hungary on the eve of the trial, so he could not testify and said he never met Chambers, except possibly once in the 1930s. Hiss’ wife, Priscilla, allegedly typed some of the smuggled State Department documents on a typewriter that was traced back to the Hiss family. However, later it was found that the FBI had suppressed a lab report showing she could not have typed the documents. The Woodcock typewriter, serving as key government evidence, was also possibly reproduced by the CIA or U.S. military intelligence, echoing the way the CIA has been alleged to be behind Guccifer 2 in the alleged Russian hack of the DNC computers. Hiss’ opponents believed they had their smoking gun years after the trial when encrypted Soviet cables, released following the opening of the Soviet archives in 1991 (known as the Venona files), exposed a State Department spy code-named Ales, whom they believed to meanAlger. 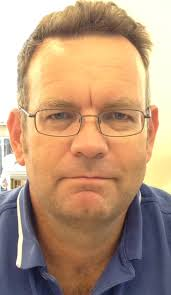 However, a 2007 American Scholar article by Kai Bird and Svetlana Chervonnaya argued that a more likely candidate was Hiss’ colleague, Wilder Foote, because a KGB operative placed Ales in Mexico City when Hiss was known to be in the U.S and the information came from someone inside the Office of the Lend- Lease Aadministration, where Hiss never worked. The Soviets showed little interest in the political information Hiss could provide, since the Cambridge Five (famed British spies) leaked the major secret documents related to Yalta. Ales hence does not appear to have violated the Espionage Act, which requires specific injury to U.S. national interest. The Hiss case exemplifies the abuse of the judicial system and manipulation of public opinion by opportunists such as Richard Nixon and elements of the Deep State during the Cold War. One can see parallels with Russia-gate here too, with opportunists such as Rep. Adam Schiff (D-CA) and his uncorroborated leaks coming from intelligence sources. These resemblances to current events are unfortunately salient. The Deep State always has wanted Russia as an enemy so huge military-defense budgets can be maintained, and so Russia does not control Central Asia’s oil and gas wealth. The main target of its political machinations today, farcically, is a Republican president who is an arch-imperialist and embodiment of the American dream in its valorization of wealth accumulation. During the 2016 election, the party of Roosevelt ran a divisive candidate in Hillary Clinton who undermined the progressive insurgent, Bernie Sanders, through undemocratic methods. Instead of looking in the mirror, party power-brokers sought to blame Russia for its embarrassing defeat and divert the public’s attention. They spread rumors of Russian electoral manipulation, which, as in the Hiss case, have never been corroborated and probably never could be. The Russia-gate investigation so far has many of the footprints of a politicized disinformation campaign, an amateur one at that, given that the January 2017 “assessment” by only three intelligence agencies—released to try to prove the charge of election hacking—was bereft of any evidence and focused mainly on attacking English-language Russian television as an alleged propaganda outlet. Gross inconsistencies also have been apparent; in the refusal by Democratic National Committee to allow the FBI to examine its computer server where the alleged hack took place and in Special Counsel Robert Mueller‘s refusal to interview WikiLeaks publisher Julian Assange or witnesses such as British diplomat Craig Murray who met with the alleged leaker. Mueller also refuses to engage with a study carried out by the Veteran Intelligence Professionals for Sanity, or VIPS, that determined the DNC data was leaked, not hacked, and that the data copying was performed on the East Coast of the United States and exceeded internet capability for a remote hack. The timing of the indictment of 12 Russian spies by Mueller on the eve of a summit between Vladimir Putin and Donald Trump was also suspicious, along with the indictment being presented as proof when it is unlikely the case would ever be prosecuted. Businessmen with ties to the Democratic Party, such as William F. Browder, meanwhile have replaced the old Wall Street Republicans in pushing the anti-Russia hysteria. They too aim to deflect attention from their commission of white-collar crime. In Browder’s case it was tax evasion, for which Putin prosecuted him. The methods of the New Cold Warriors are generally reminiscent of the old GOP in the levying of baseless accusations and adoption of methods of clandestine surveillance and attempted entrapment to discredit or prosecute Americans suspected of collusion with Russia, as had been the case with Hiss. The Democrats and liberal media pundits on CNN and MSNBC and in journals like The New Yorker appear to be oddly in sync with the extremist John Birch society, which accused Eisenhower in the 1950s of leading a communist sleeper cell. As Establishment Democrats and their fellow travelers drive much of the Russophobic hysteria in an effort to undermine Trump, it has been important for them to promote a useable past and distort the original history of the Cold War. As a case in point, Seth Ackerman wrote a piece in the supposedly left Jacobin magazine denouncing Roosevelt’s vice president, Henry Wallace, who had advocated for détente with the Russians, as a communist dupe. Ackerman then asserted in a July essay, which was at least somewhat critical of the Democrats’ current Russophobia, that “Hiss was a Soviet spy” who was “reportedly awarded secret Soviet decorations in honor of his service to Moscow.” However, even serious scholarship of an anti-Hiss bent has acknowledged that Hiss’ guilt remains speculative, and the opening of the Soviet archives has not revealed any smoking-gun evidence apart from the Venona files whose meaning is contested. Decades after the case against Hiss, he remains a “bogeyman” who continues to serve as the embodiment what happens when we let our guard down. These words resonate in our political climate where the Russian threat is again being invoked as a force to unify the people against false enemies and to steer attention from pernicious economic arrangements and criminal malfeasance by political donors. Spooked by insurgencies on both the right and the left in the 2016, the Establishment is worried about growing social unrest, both of which have been smeared as being influenced by Russia. New bogeymen are again being created to sustain a dangerous confrontationist policy toward Russia whose consequences may be even worse than the first Cold War. If you value this original article, please consider making a donation to Consortium News so we can bring you more stories like this one. Please give to our end-of-year fund drive, by clicking Donate.